House Dance is a descendant of disco that evolved in the 1980s. First appearing in clubs in New York and Chicago, it grew in popularity as people around the world fell in love with the dance. Due to its origins, House Dance is a highly social dance style that holds a special emphasis on self-expression through Freestyling. House is free flowing and a great dance to learn. Why do we teach House? 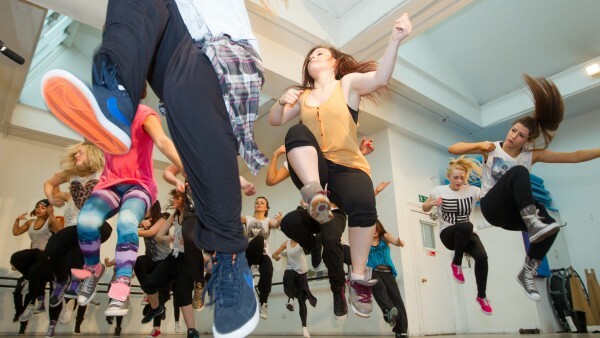 House is an integral element to the commercial dance courses that we teach because of its unique moves. This is in addition to its ever-enduring appeal amongst commercial directors and producers of everything from musicals to advertisements. House also falls under the umbrella of Street Dance, which helps students develop a rich appreciation of different Street styles. As House Dance and House music is ever popular in dance clubs around the world, you’re probably aware of many of the moves. The Crossroads is a class House step. It involves crisscrossing legs, to the rear and to the front, whilst moving sideways across the floor. The Jack in a Box is one of the most basic House Dance moves. It’s similar in nature to Pliés in Ballet. The move involves bending the knees outwards to the beat of the music with arms moving in a synchronized fashion. As you might have guessed, the Pas de Bourrée is a Ballet-inspired House Dance move. It involves crisscrossing legs to the beat in angular motions. If you love the idea of learning the Pas de Bourrée, or Jack in a Box, and fancy a little chat with Angela, our friendly Course Director, before you apply, please get in touch on 0207 118 1818.